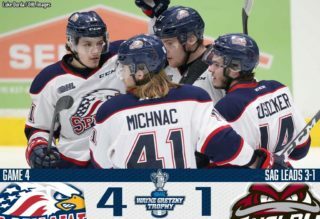 The Windsor Spitfires overcame a 3-1 deficit, with Chris Playfair (1) netting the third period game winner in a 4-3 victory over visiting Barrie. 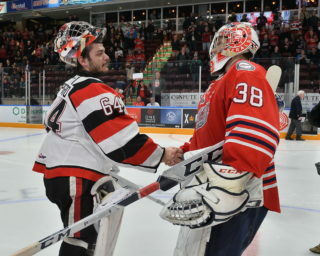 Goaltender Michael DiPietro made 27 saves to tie Andrew Engelage for the Spitfires franchise lead in career goaltending victories with 78 on his OHL career. Down a pair, the Spits scored three unanswered as Daniel D’Amico (2) and Connor Corcoran (3) knotted the score for Playfair’s winner. 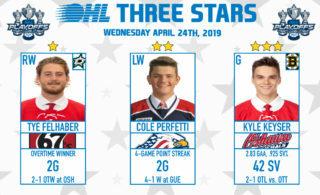 Luke Kutkevicius (3) also scored for Windsor while rookie Jean-Luc Foudy had a pair of assists. Luke Bignell (2, 3) scored twice for the Colts while Ben Hawerchuk (6) also tallied and Aidan Brown recorded two assists. The Spitfires climb to .500 at 5-5-0-0 while Barrie sits at 5-5-1-0. 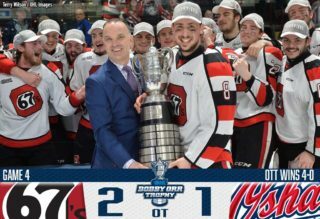 Sophomore forward Adam Varga (1) scored with 1:24 remaining in the second period, a goal that would stand as the difference maker in a 4-3 Mississauga Steelheads road win in North Bay. Richard Whittaker (2) and Cole Carter (11) opened the scoring for Mississauga in the first before the Battalion rallied to tie things up in pink. Ryan Barbosa’s (1) first OHL goal reinstated the Steelheads lead before North Bay knotted things at three. Cole Schwindt and Michael Little picked up assists on Varga’s winner while goaltender Jacob Ingham made 25 saves. Matthew Struthers (6), Justin Brazeau (9) and Brandon Coe (1) found the back of the net for North Bay while Egor Postnov picked up two assists. The Steelheads lead the Central Division at 7-2-1-0 while North Bay falls to 4-7-0-0.